It is widely believed that the relationship between gold and inflation is a strong one. But when one looks at the relationship between gold and CPI, it can be demonstrated that there is no enduring relationship. So what is the explanation for this finding? I will demonstrate that the CPI does not act as a good proxy for inflation. The best measure of inflation is the price of gold itself. In this context, gold and inflation can be shown to have a very strong relationship, even if movements in the CPI do not reflect this. There is a simple way to measure inflation: ignore the CPI and look at the price of gold. This is how inflation was measured for centuries as countries pegged their currencies to gold. The attachment to the CPI as a measure of inflation has to go down as one of the greatest mistakes of our age. Not only has the CPI never been an adequate measure of inflation since its inception, but the method of calculating the CPI has varied since its birth. The CPI statistic does not give an adequate like-for-like measure of price change over time because the underlying basket of goods that it is calculated from is constantly changing. In addition, the way the CPI itself is calculated has changed over the decades. 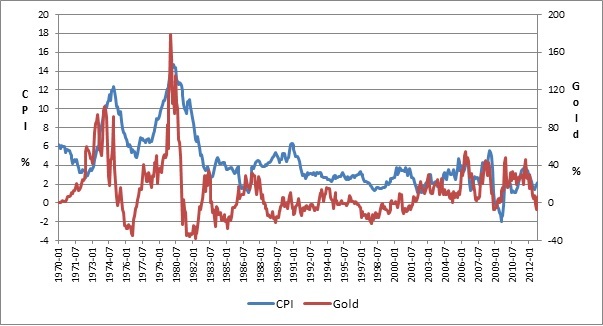 So it’s no surprise that the relationship between gold and inflation, as measured by the CPI at least, is weak. Not only is the relationship between gold and CPI weak, but the relationship between the CPI and any of the commodities is weak. This only demonstrates the flaws in the design of the CPI. Take a look at the chart below. 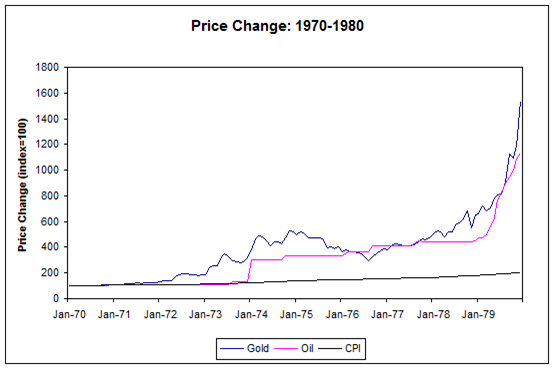 It shows the run-up of gold and oil prices in the 1970’s and also the CPI over the same period. 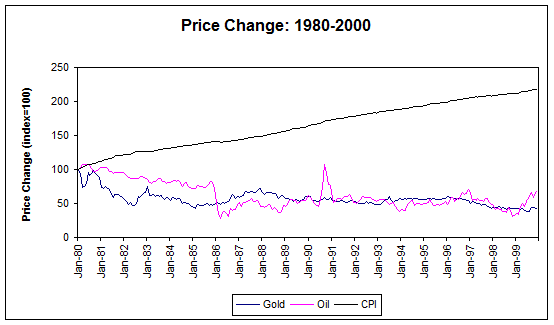 What you’ll notice is how the two commodities: gold and oil increased at a vastly greater rate than the CPI. So what was happening? When living standards are degrading, as they were in the 1970s, the basket of goods within the CPI is lowering in quality. This means that the CPI gives us a lower reading for inflation, than goods of constant quality, like gold and oil. We had the situation in reverse in the 1980s and 1990s. Living standards rose in these decades and hence the CPI basket was improving in quality. This led to an upward bias in the CPI relative to gold and oil. In the last 12 years, we’ve had the 1970’s situation again. CPI is vastly under reporting the true rate of inflation as living standards degrade. 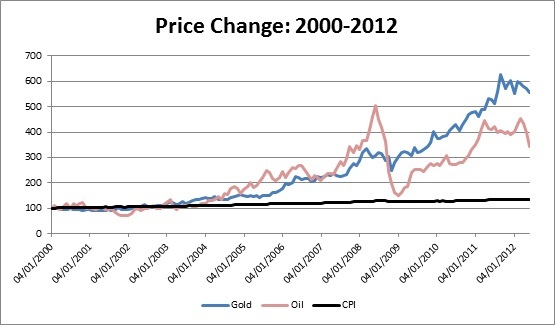 The overall view from the charts is that there is no long-term relationship between the CPI and gold or oil. We see more of a relationship in short-term movements between the CPI and gold. There is a feedback effect, whereby price movements in commodities feed through into the CPI. This is most obvious when commodities spike in price, such as in the early 1980’s. However, the difference in scale between the two axes shows that there is no direct link between the two. Gold has been significantly more volatile and normally moves ahead of the CPI. Changes in the price of gold are the most accurate measure of inflation we have. The reason for confusion in the matter is that the CPI has been widely adopted as a measure of price inflation. As the relationship between CPI and gold is weak, people erroneously assume that the relationship between gold and inflation must also be weak. Historically speaking, inflation has been measured through simple observation of the gold price – not by using an artificially constructed CPI measure. By moving back to gold, you can rebase nominal values by the price of gold (see gold ratios) and get a grip for the TRUE real movements in these assets.